Every year thousands of new Catholics are welcomed into the Church through baptism and the Sacraments of Initiation (Baptism, Confirmation and Eucharist) during the celebration of the Easter Vigil. 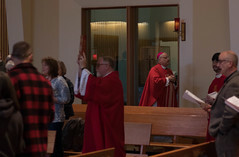 In the Diocese of Juneau, 36 people received Sacraments at Easter Vigil, Easter Sunday, and First Week of Easter celebrations. At St. Paul the Apostle Parish in Juneau, Wyatt Sanders Carlos, Tenaya Rouget Sanders, Brian Duncan, and Andrea Vasquez received the sacrament of baptism. Sarah Roemeling and Madison Gambala entered into full communion with the Catholic Church, and Koneal Laguidao, Elijah Laguidao, Kendra Willard, Rachael Lavigne, and Kelsey Venechuk received the Sacraments of Initiation. 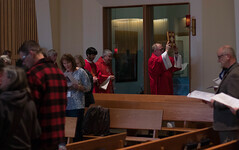 15 children were baptized at Holy Name in Ketchikan, 14 of whom were students at Holy Name School. Finley John Gabriel Bisson, Lucas Anthony Dupea, Baiden Lee Dupea, Torbin Robert Beimler, Benjamin William Lemerond, Tristen Alan Lemerond, Ashton Jonathan Paul, Luke James Paul, Ariel Evangeline Paul, Cruz Liam Oliver Perry, Ava Elisabeth Thomas, Carter James Thomas, Lila Ko’i Villaflor, Riylan Villaflor, Ariel, Ashton and Luke Paul, and Ryan Beer were all baptized at the Easter Vigil. Brother and sister Abigail and Gaven Hills received the Sacraments of Initiation at St. John by the Sea Parish in Klawock. Ella Scott was baptized at Sacred Heart parish in Haines and Bear Scott received the Sacraments of Initiation. Madison Conatser, and sisters Nina and Olivia Callier received First Holy Communion on Easter Sunday. Two infant girls were welcomed by the community of St. Gregory Nazianzen in Sitka at Easter. At the Cathedral of the Nativity of the Blessed Virgin Mary in Juneau, Sean Goertzen received the Sacraments of Initiation on the Thursday following Easter.